Hi there! Long time, no see! I apologize for the disappearance! I must confess it’s been crazy over here. I’m currently in my dad’s hometown, recovering from a week of crazy fun, lots of work and not enough sleep. Last week we celebrated the town holidays. Putting in words what we do over here when that happens, it’s sort of complicated, but I’ll try my best. The holidays are called ‘Los toros’, literally, the bulls. There’s no animal sacrifice of any kind, but there’s bulls and cows involved. The animals are put in a ‘plaza’, people run in front of them, they run after the people. Sometimes people get caught and it isn’t pretty, but usually everything works out just fine. Even though that’s one of the main activities, there’s many others. The ‘cuadrillas’, which are groups of friends around the same age, get together and party all day long. At night there’s the ‘charanga’. That’s a popular procession around the town, following the town’s band, asking (literally) for water. No joke. The idea is to get totally soaked with the water that people throw down their balconies while dancing around and singing traditional songs. After midnight, there’s always dancing of some kind and ‘toro embolao’ which feels too complicated to explain. In addition to the regular lack of sleep, this year, my group of friends, were organizing the holidays. That means assembling tons of stuff, setting up tables, serving drinks and controlling that all the rules are followed when there’s bulls involved. It’s been a lot of work, but it’s been totally worth it. There’s no better way to bond with your friends than staying awake day after day, past dawn and looking at each other with tired eyes and a smile on your face. Like I said, it’s hard to put into words what’s been going on. 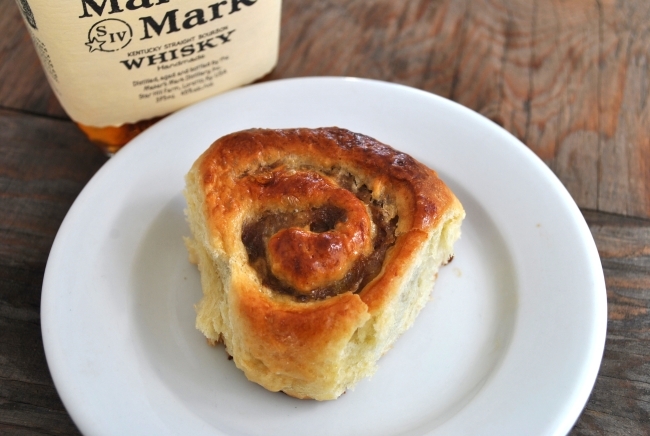 What isn’t hard to make or enjoy are these bourbon banana rolls. 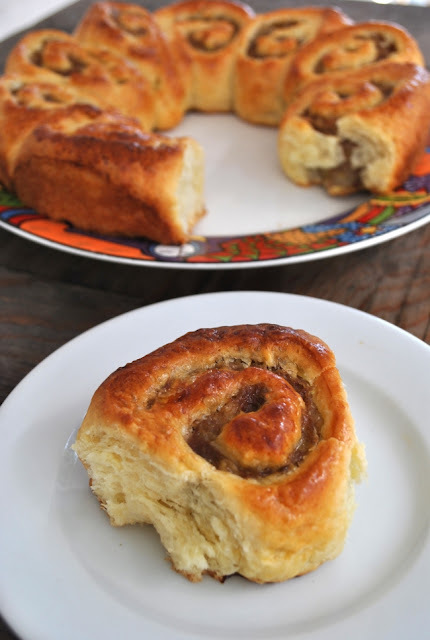 They’re made with a simple sweet dough and filled with bourbon cooked bananas mashed with some cinnamon. One could say they are bananas flambé inside a brioche. I got the sweet dough recipe from ‘Artisan baking’. The process is quite long but totally worth it. You’ll get the softest rolls you could imagine. This is my contribution to the BBD# 33: Breads with booze which I have the pleasure to host this month. There’s still plenty of time to participate, so go for it! Microwave the milk for 4 min or heat it in a pan until bubbles form around the edges and the milk smells cooked. Let it cool to 105 F and dissolve the yeast in the milk. (Scalding the milk denatures the proteins that prevent gluten formation). Let it stand for 10 minutes. In a large bowl, add the flour and then the yeast mixture and eggs. With a wooden spoon or your hand, mix until combined. Cover the bowl with plastic and let it stand for 15 to 20 min. Add the salt to the dough and mix until combined. Take the dough out of the bowl and knead until smooth, for about 10 min. The salt will incorporate just fine. Add half the sugar and keep kneading, then add the other half. Finally, add the butter in 2 additions and knead it into the dough until this is satiny and soft. Place the dough in a covered container in the fridge, for at least 8 hrs and up to 48. Cut the bananas into big chunks and cook in a pan with the bourbon until all the liquid is absorbed. Transfer the bananas to a bowl and mash together with the cinnamon. Let the filling cool. Roll the sweet dough into a rectangle, ½ inch in thickness. 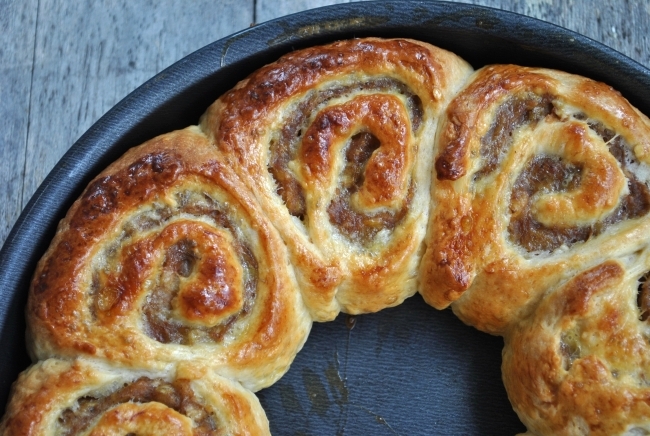 Spread the cooled banana filing and roll the dough like you would do with a swiss roll. 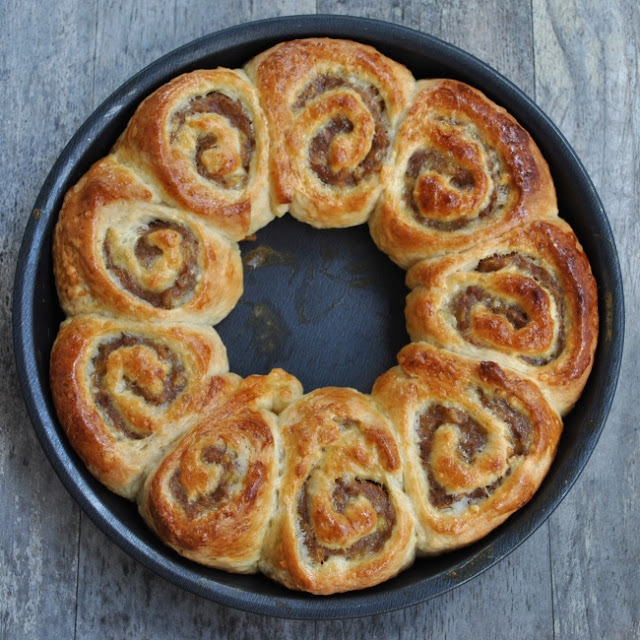 Cut the dough into 1 to 1 ½ inch pieces and place them in a round pan. Let them rise for 30 min. In the meantime, preheat the oven to 325 F. Brush the rolls with egg wash. Bake them for 30-35 minutes or until golden brown on top. Let them cool slightly before eating. Molt beeee, els estava esperant!! Fiestuki pal cuerpo, ja veig, pero es la millor manera de disfrutar de les vacances! M'encanta la receptaaaa, molt bona idea lo del platan! The most important thing is that you're enjoying yourself in the midst of craziness. These look soooo good. I mean that. Delicious. Lovely pics too! It sounds like you had lots of fun on vacation! Banana bourbon is one of my favorite flavor combinations. Adriana, I think you explained your town holidays pretty well :) Bones vacances bonica i bona sort per Portland!! Great combination. Banana and bourbon = DELICOIUS! Hahahaha, quina gràcia llegir aquest post (traduït al català, of course), ja imagino la cara dels teus amics americans intentant entendre que és un bou embolat. Pel que expliques, suposo jo que el poble del pare ha de ser per l'Ebre, no? A veure si abans d'agafar l'avio et podem fer un petonet. Ah, per cert, em xifla aquesta recepta. Una forta abraçada, baby! Un abrazo desde el CartoonCooking! These are beautiful, in an I-just-want-to-grab-it and eat it kind of way--great picture that has inspired me to try your recipe. Oh, this bread sounds fantastic! I'm about ready to send in my entry. OMG!!! That is so yummy!!! Adriana, this looks amazing! I will bake it soon! Loved the idea and the pics! Already posted mine and sent you an email about it! I'm drooling all over your post, so tasty and beautiful, great combination of flavors, too.